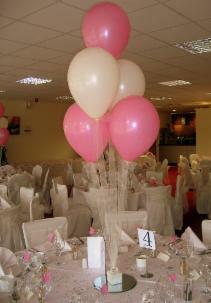 Helium filled balloons arranged singly or in clusters, and anchored to a weight are popular as table centrepieces. They can also be used to decorate top tables, buffet tables, gift tables, cake tables etc. Any of the designs on this page can be made up for floor standing or table display. This does not affect the price. We inflate our helium filled balloons on site at your venue, to ensure they are in the very best condition for the start of your event. 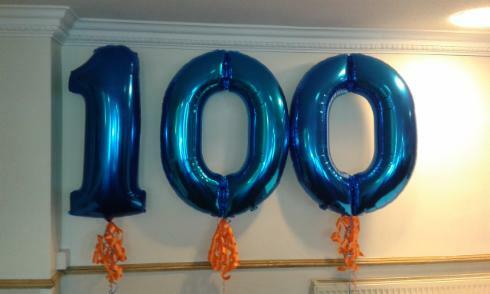 Latex and Foil Balloons are available in most colours, and with hundreds of different prints and messages to suit almost any occasion. Co-ordinating ribbons, and gift box weights are included. Why not add a sprinkle of Table Confetti to each of your tables? 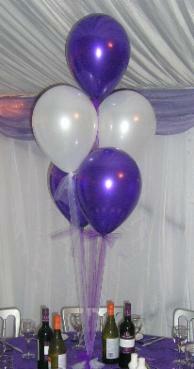 Available in a wide variety of shapes and colours to coordinate with your colour scheme, and overall theme. Only £1.00 per table. Please see our Table Confetti page for details. 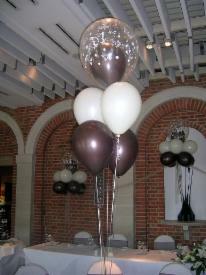 Larger helium filled arrangements, or single large balloons can be used as floor standing decor, either side of a doorway or entrance for example. 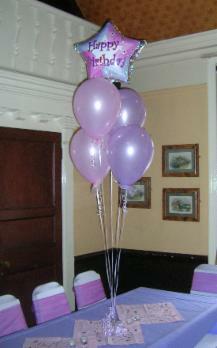 These designs can include one or more of our 'double bubbles', or 'balloon in a balloon'. 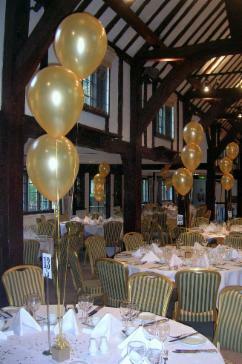 These are large clear balloons with smaller balloons inside in the event colour. 3 printed Double Bubbles with tulle ribbons (for floor or table display) £22.00 per cluster. This example is with a butterfly print, but these are also available with 'Just Married' prints, 'Happy Birthday' prints, Stars, Doves, Hearts, Roses etc. Giant 36" foil balloon with tulle ribbon, and 2 hand made bows to decorate £16.50 each. Shapes available are Star, Heart, or Round. Many colours available. 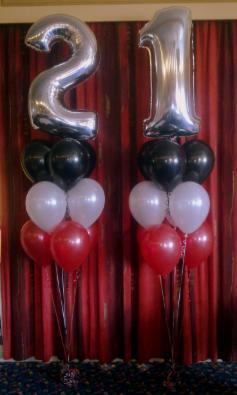 Giant 36" Foil Numbers with hanging ribbons £12.00 each. Various colour combinations are available. Giant Foil Letters also available at the same price. All photos on this website have been taken by us, and show work carried out only by our staff. We do not use photos of work carried out by other venue decorators, or use stock photos from balloon manufacturers' catalogues or portfolios. 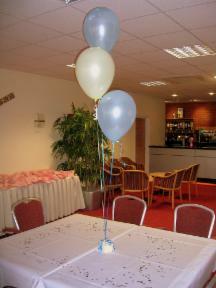 Latex and foil balloons are available in a wide variety of colours. If there is a particular colour you are looking for, please contact us, and we will do our best to get it for you. Please Note ~ We are sorry, but we are unable to inflate balloons already purchased by customers. The balloons we supply are of the very best quality, and are sized using our specialist equipment, to ensure they are floating long after your last guest has said goodbye! Email us today to discuss our availability for your forthcoming event.